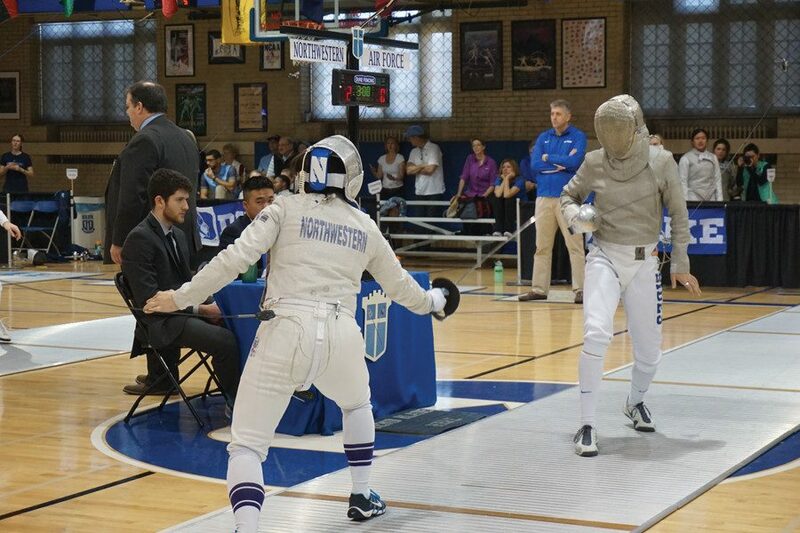 A Northwestern fencer battles an opponent. The Wildcats will compete in the Vassar Invitational this weekend. Northwestern enters Saturday’s Vassar Invitational in Poughkeepsie, New York, as the favorite in all eight of its matches. As a result, the Wildcats have very high expectations for the upcoming stretch. This is the third consecutive year NU is competing at the tournament. Over the previous two years, the Cats were 15-1, having only lost in 2015 to Cornell, which is not fencing at the Vassar Invitational this year. Instead, NU will face off against City College of New York, Fairleigh Dickinson, Haverford, Queens, Sacred Heart, Stevens, Wagner and Wellesley in a nine-hour span. The Cats fenced against six of their weekend opponents last year at the invitational. In those meets, NU finished with 133 individual wins and only suffered 29 individual losses. Its results included a 24-3 win over Queens and a 26-1 victory over Haverford. Two sophomores were injured over the past week. Epee Adelle Berdichevsky was hurt in the final practice before the Elite Invitational and will be sidelined for the second straight event, Moss said. Sabre Abby Tartell, who went 7-2 on the first day of the Elite Invitational, was injured in pre-bout warm-ups on Sunday and will also be out. Even with the lack of high-quality competition this weekend, NU will still look to improve on its previous performances. Freshman epee Anya Harkness said the team recently discussed staying mentally focused after losing early bouts, which happened against Penn last week. In addition to winning all eight meets, Moss has other goals he wants to the see his team accomplish. He said he hopes the Cats continue to find and cultivate their identity as a team. Moss said NU is going to outwork everybody, is extremely passionate for the sport and will never give up. Although the team identity is still in flux, junior foil Yvonne Chart said the Cats’ chemistry is as strong as it has been in recent years. She added the team has come together as a group and this year’s team chemistry has already surpassed that of last year’s team.